The third Annual Bowl For Ronnie Bowling Party, benefiting the Ronnie James Dio Stand Up and Shout Cancer Fund, will be taking place on Friday, October 6th, 2017 at the Pinz Bowling Center in Studio City, California. As previously reported, auctions be taking place at EBay for a spot on on Eddie Trunk’s team. To place your bid, while also helping to contribute to the Ronnie James Dio Stand Up and Shout Cancer Fund, please click here. The event begins at 6:30 PM, at Pinz Bowling Center, with open bowling and a VIP pre-party for lane sponsors, celebrities and their guests. Celebrity bowling will commence at 9PM, with fierce competition for a variety of trophies. In addition to competing with his team, radio personality Eddie Trunk will once again host the event. 100% of the net proceeds from the Bowl For Ronnie will go to the Dio Cancer Fund. Individual tickets and lane sponsorships are now on sale, and participants are encouraged to gather friends, family and co-workers for the ultimate bowling team. Pinz Bowling Center is located at 12655 Ventura Blvd in Studio City, California. 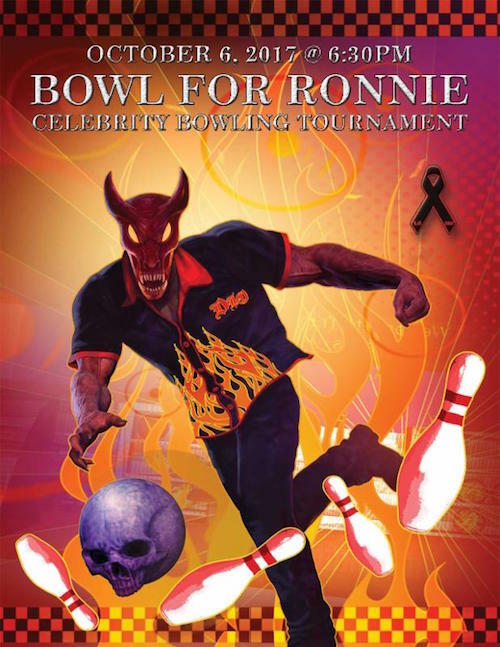 For more information, visit diocancerfund.org/bowlforronnie. Tickets are now on sale at eventbrite.com/e/bowl-for-ronnie-tickets.